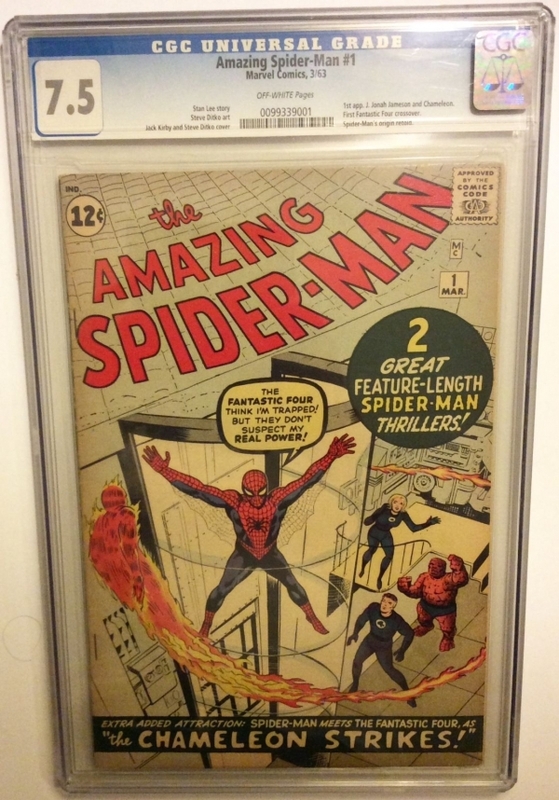 Up for sale is a CGC 7.5 Graded copy of Amazing Spider-man # 1 Classic cover with the Fantastic four. You are bidding on a Rare and Beautiful Copy, an ICONIC and absolutely stunning Must have title. This book has been increasing in value steadily and is without question a perfect addition for an Amazing Spider-man, fantastic four, Stan Lee or Marvel collector. Key book in the Marvel Universe!! Key character in several Movies due out soon!! 7.5s have been going between 17- 20k, perfect opportunity for a collector to acquire this in an open auction. No chipping really gives this book great eye appeal. Rarely do these go on open auction on ebay so good luck. Please read requirements below. A must have for any Comic Book Collector and a rare opportunity to own a Silver age Key issue, these are Highly sought after and have some of the most beautiful artwork. Books like this one only go up in Value over time, an investment grade issue. Perfect for display or to keep long term. The Amazing Spider-man is a must have Classic title and is well known for the amazing artwork. This book is one of the most beautiful and important Silver age Keys in The Spider-man run, its intro Solidified Marvel as a power house and Spidey as a Super Hero, makes it highly desirable and rare in high-mid grade. It is nearly impossible to find Raw Copies of these that are worth grading. The $$$ and Hard work has already been done for you. All Serious bids will be considered. If you Have any Questions Please Email me….I do offer a 30 day time payment with 50 % down at auction win... No single digit feedback bidders on this item unless you notify me in advance. Any suspicious bids will be canceled!!!! International will only be to Canada and i ship Fedex!!! No exceptions.